Meatless Monday: Southwestern Stuffed Sweet Potatoes – Elly Says Opa! I keep a lot of random lists in Evernote, one of which includes things I want to cook (typically, ideas I have for original recipes). One of the items I have on that list is “stuffed sweet potatoes (black beans, queso fresco, chipotle, etc. )” So clearly when I came across Nikki’s post for Southwestern stuffed sweet potatoes and realized someone had already done all the work for me, I added these to our menu. I had high hopes for these, because I love all the ingredients. And despite those high hopes, these stuffed sweet potatoes actually surpassed my expectations. Even as recently as a couple of years ago, if you would have told me that sweet potatoes and black beans were a great combo, I probably would have given you the side eye. But, I’ve definitely come to find out it’s true. 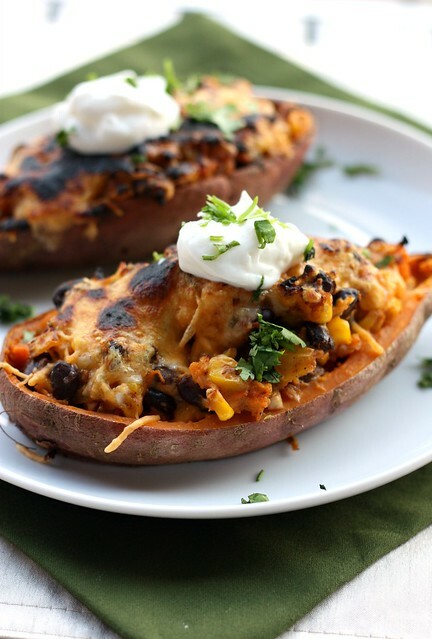 These sweet potatoes are packed full of our favorite things – black beans, chipotles, spices, corn, and lots of cheese. I’ve come to adore sweet potatoes and butternut squash with some heat from peppers (forget that marshmallow and sugar nonsense), and the sweet and heat work so well in this dish. Plus, the beans provide protein and make these very filling. I made the entire meal, from start to finish in the cast iron skillet (baked the potatoes, sauteed the corn and onions, put the stuffed potatoes back in there and stuck it under the broiler). About 30 seconds after I stuck these under the broiler, Zachary was running around, fell, and bit his lip. Of course, as I was tending to him, I kind of forgot about the potatoes so mine were a little….well done. Caramelized, if you will. Thankfully, they still tasted fabulous. Saute the corn in a dry heavy skillet, preferably cast iron, over medium high heat. Sprinkle with salt, cumin, chili powder and oregano. Cook until the corn is roasted and browned (about 7 to 10 minutes). Transfer to a small bowl; set aside. To the skillet, add the canola oil over medium heat. Add the onions and cook until just tender. Remove to the bowl with the corn; add the black beans and as much cilantro as you wish to the bowl and lightly mix to combine all ingredients. When the sweet potatoes are cool enough to handle, cut them in half, lengthwise. Carefully scoop out the flesh, leaving about a 1/8" border in the skins, and place into a large mixing bowl. Stir in the cream cheese, sour cream, chipotle pepper(s) and salt to the mixing bowl with the sweet potatoes. Mash with a potato masher to desired texture. Gently stir in the corn and black bean mixture.